In home decorating, vignettes are an arrangement of objects grouped together to create a focal point. 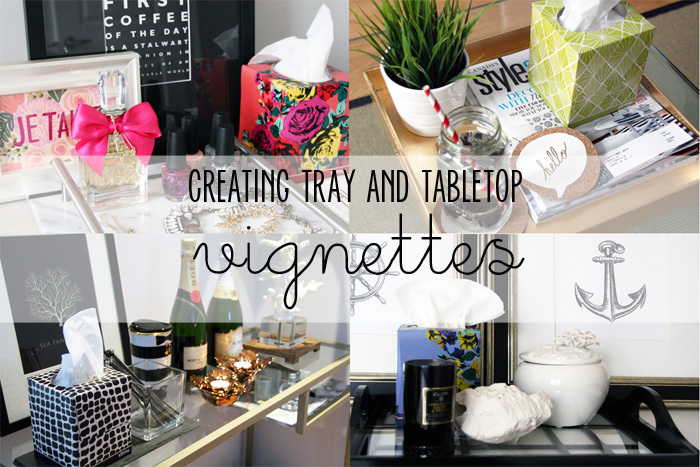 I love vignettes and have been creating a few of my own at home. It really adds an interesting element to your space and if you do it right, each vignette can tell its own story! In this post, I want to show you how easy it is to add a bit of wow to any room in your home with a simple do-it-yourself vignette. The coolest part? Thanks to this recent collaboration with Kleenex, I am using beautiful and colourful Kleenex packs as the main source of inspiration. 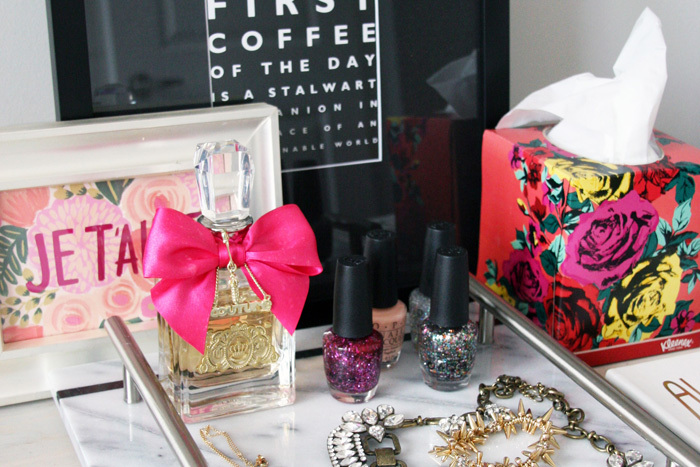 I dressed up my DIY marble vanity tray by gathering a few of my favourite jewelry pieces alongside with bottles of glittery nail polish. If you’re arranging this in your bedroom or bathroom, consider daily essentials – such as my perfume bottle that I wear every day. Pick a colour scheme to create a cohesive arrangement. I decided to use my pink floral Kleenex pack as the key colour inspiration – shades of pink. Top off by placing a couple of your favourite framed prints. My prints are actually greeting cards, can you believe it?! A coffee table tray is both decorative and functional. Here, I decided to add glam to nature by using greens as my main colour source, arranged on a gold tray. Placing magazines on your tray is a great way to organize and de-clutter while keeping coasters handy, which is a must (especially on a glass table!) Just make sure you try a fun set! 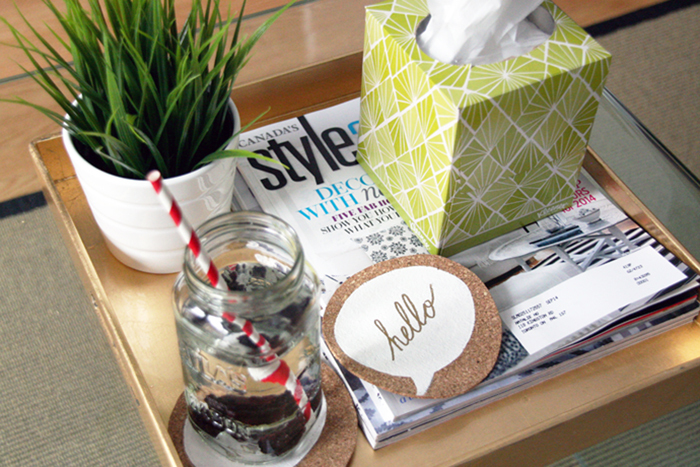 Shown here are my DIY conversation bubble cork coasters (so easy to make, and coming soon!). This green Kleenex pack gives off a Spring/Summer vibe, so I was sure to pair with a potted plant or alternatively could have gone with a small vase of flowers. I had previously transformed this computer desk into a bar cart, which really can also be re-transformed into an entry way table. In this vignette, I combined the two concepts by replacing some of my bar cart items with a beautiful coral table lamp and along the same theme, a coral digital art print. 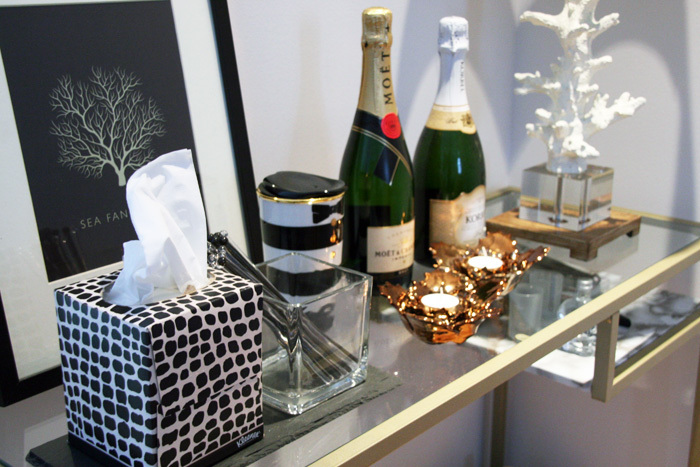 This black and white Kleenex pack presents a contemporary style. I decided to add a touch of warmth by including a few gilded items such as the tea light candle holders and a black and white striped tumbler to complete the look. To make your guests feel especially welcome, prepare a dresser tray in the guest room where they can place their valuable items before getting a good night’s rest! 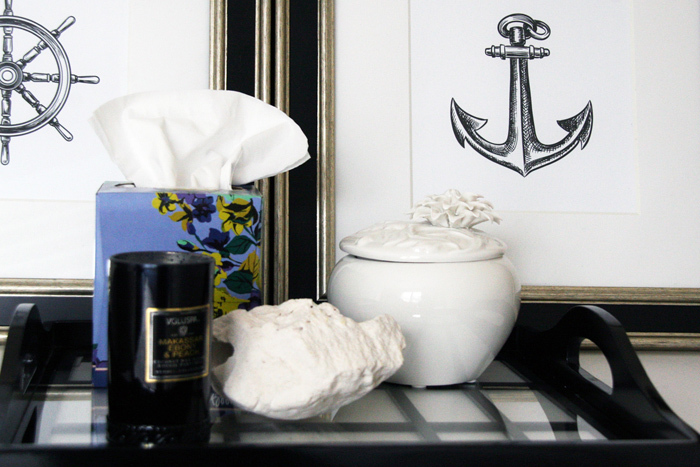 In my guest room, I’ve arranged this tray with a simple palette of black and white coupled with a pop of colour from this blue floral Kleenex pack (trust me, your guests will thank you for not having to run to the guest bath for tissue). Place a few scented items such as candles or a diffuser to make the room smell great. I’ve filled the porcelain jar with chocolates to make the stay that much more inviting. I hope you’ve enjoyed this post on creating your own vignettes and how exciting are these super adorable Kleenex packs? I encourage you to collect small, decorative items over time for your vignettes; they can be extremely inspiring! The Kleenex brand will celebrate 90 years in 2014 and plans to celebrate in Style with these newly designed Kleenex® Expressions Tissues – All the softness you expect from Kleenex® tissues with unique box designs to help decorate any room. Disclosure: This post was brought to you by Kleenex via Glam Media Canada. The opinions expressed herein are those of the author and are not indicative of the opinions or positions of Kleenex. Wow those look amazing! Nice to see Kleenex coming out with these great designs!